It’s around 3 p.m. on Christmas Eve, and for the first time in my entire life I am not celebrating with my family. I’m not at my parents’ house, where right now my brothers and their families, my sister and her boyfriend, my parents and their dachshund, Max, are hanging out. I don’t know what they’re doing. Probably the cousins are running around, playing games or watching TV or doing crafts before the 4 p.m. mass, while the adults sit in the family room, where a fire blazes in the wood stove, chatting with each other about this or that. There might be snacks already, but it might be to early for Mom’s pizza rustica and my sister-in-law Trish’s sausage pastry rolls and whatever else anyone prepared. I know there’s probably not spinach dip, because I am the one who usually makes that, and I’m not there. For the first time in 11 years — their entire childhood — my kids are not going to sing carols or exchange homemade cookies with their cousins. My kids won’t get tucked in together in the upstairs room, wishing for sleep to come as fastasthis so Christmas morning will come as soon as possible. When Ray and I decided to not export our Christmas this year — for the first time in forever — I knew things would be a little strange. Frankly, it was a huge relief to not to shop online and ship all the gifts out of state, to not spend Christmas Eve feverishly wrapping everything, to not have to pack and drive three hours and live out of a suitcase for a few days. I was really excited to start some new traditions in our house for a change. For the kids to creep down our own stairs on Christmas morning and peer around the corner to see what Santa may have been up to while they slept. And we are. Joanna and I just mixed up a batch of sugar cookie dough and are waiting for it to chill before we cut and bake. Although I don’t have a piano, and for the first time ever won’t be accompanying the carols, I did strum my guitar the other day and feel reasonably sure I can provide a little background for our singing later. It’s a little strange. Change always is, I guess. New traditions don’t just spring up, fully formed and familiar-feeling. They come from years of tending and feeding, and the strongest ones are the ones that stay. This year, right now, I’m feeling peaceful and right about staying home for Christmas. But I miss my family — the noise, the stress, the chaos, the annoyance, the laughter, the song — I miss all of that. I sure do. Sure, I was an English major in college. Sure, I write fiction and read a few books a week. It’s not hard for me to see symbols and metaphors and allegories in the text before me. But in the real world? Sometimes I’m a little too skeptical and pessimistic about the mystical quality of the universe. Then I have experiences like my lost-and-found engagement diamond, where you have to wonder if finding the small stone in a house full of floor cracks and crevices was more than luck. Other things are more subtle, less dramatic or laden with emotional weight. A few weeks ago, a package came in the mail for Mitzi — six tiny caterpillars that we got so our budding scientist could watch them morph into butterflies some day. And they did their thing, finally housed in dangling chrysalides, which we transferred to the butterfly house. And we waited. The first two butterflies emerged last Saturday, shortly after we’d finished coloring our Easter eggs. We were thrilled, not only by the actual happening, but the timing. What could be more special than new life on Easter? But they weren’t through. By the next morning, Easter Sunday, another three had found their way out. We marveled and ooh-ed and aah-ed and hustled out the door for the rest of the day. Number six was still hanging, and I was a little worried. Mitzi would be very sad if something went wrong. Which of course, it didn’t, and as I was sitting at my computer that night, catching up on emails and Facebook status updates, I heard a crackling coming from the window sill where the mesh container sat. Butterfly number six had broken free, wings wet and useless, clinging to the shell that helped it change so drastically, resting, waiting to fly. 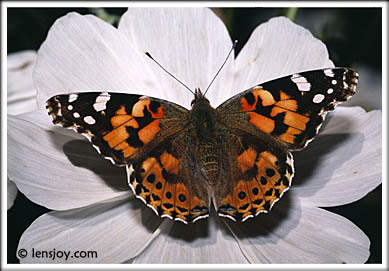 I know that six painted lady butterflies, with their 3-week life span, are not going to make a difference to the big, wide world. But in our little universe, in our little family, those six butterflies, rebirthed on Easter, have reminded us that change is always possible, that new beginnings can happen any time, and this is just the season to get started. 2008 was a year of reconnecting with old, old friends, via Facebook, primarily. I’m glad for the service, because without it I would never have gotten the energy or motivation to reach out to the friends I’ve contacted these past six months. I mean, what’s better than a virtual reunion — getting caught up without having to diet? I love it! 2008 was a year of NOT being diagnosed with terminal illnesses. My health exams continue to be clean. Praise. Please donate to any breast cancer or women’s health care society. 2008 was a year of NOT being pregnant. A post for another day; an ambivalent emotion. Finally, a birth control that works (email me for details). Still, cuddling my niece/goddaughter Cameron makes me wonder, am I really done having babies? 2008 was a year of watching my children cultivate their independence. School and friends expose them to stuff I’d put off a while (” The Clone Wars” and “Hannah Montana” spring to mind). But natural maturity leads them to not only tie their own shoes but also wonder why water freezes and how babies are made. Potty training parallels social obligations in frequency, demand, and unpredictability. I am sort of not prepared. Oh, how do my kids feel? Hmm…is parenting about them? 2008 gave me the chance to remind myself of my identity beyond being a Mom. Since Mitzi’s birth seven years ago, I’ve done little but change diapers, lactate, give birth, nurse, change, play with, dress, cajole, punish, and adore 4 remarkable kids. Will you think less of me when I admit that sometimes I feel that I have a bit more to share with the world outside my home? This year I took stock of my skills as a Mom, a teacher and a writer, and hopefully have set into motion the beginnings of new adventures for me, Jennifer-beyond-Mom. 2008 showed me that commitment is more than passion and interest. It’s staying connected regardless of the dry spells, the confusion, the apathy. Commitment is acknowledging that nothing is easy, no matter how important or miniscule it appears to the naked eye. Love, marriage, parenting, career, it all takes work. Any day we can wake up bored, uninterested, tired, uninspired. Taking the next step, seeing beyond the moment of apathy to the moment of enlightenment — well, that’s the stuff of commitment. For 2009, mostly I wish for you all honesty, in feeling, in manifestation, in conversation, in the quiet of your bedroom, in the chaotic anonyminity of Donovan’s or whatever local bar you and your significant other have visited in order to share some Guinness stout and truthful revelations. For my part, I can honestly say this — I am not perfect. In any area of my life. That’s okay with me — in fact, it’s a relief. When you’re staring down 40 years old,the imperfections and failings of your adolescence are as mushy and in-the-past as pureed peas. I hope that my kids can see me and know that despite my imperfections, I strive each day to better myself in ways big or small. I don’t want perfection; I want to avoid stagnation. I want to be better for them and for me. 2009. Here it comes. We’re all ready. The question is, is 2009 ready for us? We got our new car today! The kids love it, although Joanna refused to leave the old car for quite some time while we were at the dealership. Then on the way home she kept asking where “our” car was. The roomy interior is dreamy, and of course it has a myriad of bells and whistles, mostly media-related stuff, that I will likely never figure out how to use or care to use in the first place. 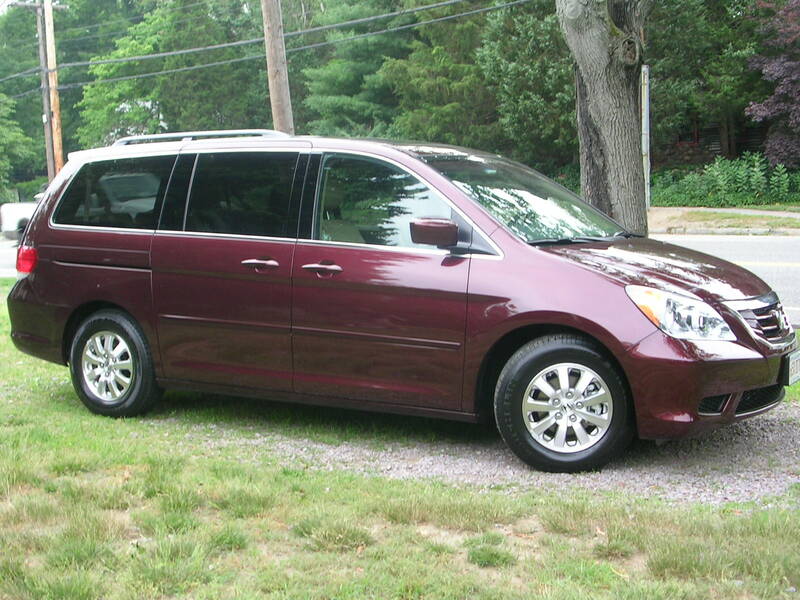 It’ll be interesting to see how the four kids and I, plus all of our stuff, fit into this new set of hot wheels when we make our trip to Connecticut for vacation tomorrow! Afterwards the kids had some playtime on the playground, and we brought home bagels and coffee for our celebration. All that by 10 a.m. Whew. Okay, the oldest joke in the world. But I’ve been swimming in denial for a few months now, and am just feeling ready to talk about it, because it’s really going to happen. Michelle is my little sister, the baby of the family. (She hates to be called that, but to me, oftentimes, that’s what she is.) At the same time, for most of my life she’s been my best friend, strongest supporter, fiercest defender, disher of tough love. She has an amazingly gentle heart and incredibly strong shoulders. I hope I’ve been somewhat the same for her. Next week she’s leaving the East to embark on a journey West, to the land of big skies, of wide open spaces, where she’ll work on a ranch for six months, leaving behind the fast-paced world of corporate America, Blackberries, deadlines and cafeterias (but thankfully not her blog, email or cell phone, come on now.) This position been a dream of hers for years now. The move is a courageous, joyous one, not lightly made or softly planned. I couldn’t be more thrilled for her. Really. And since we live so far apart now, it’s not like we’re ending our weekly lunches or daily workouts together. Live the dream. It’s not about me. Go for it. All that stuff. I know there’s nothing to be upset about. But there’s something sad about the change. What if she won’t be able to chat on the phone 95 times a day like we do now? Or email at the drop of a hat? What if the kids want to call her and leave a song message on her voice mail? Sure. But when she went to college I was gone too, and we were too young to be sad at goodbyes. Look at your auntie. She is brave. She is taking a chance to fulfill a dream, risking a comfortable and certain present for an unknown future. And, kids, make sure you ask her how alive it makes her feel to do that. Ask her if colors seem brighter, the wind a little sweeter. And always remember, my babies, I might think to say, remember that the unexamined life is not worth living. You only get one go-around. Make it count. Well, I had good intentions with this blog. But some stuff happened in 2007 and I didn’t manage to get a single thought written. I found the lump in my left breast the week before Christmas 2006, and rang in the new year waiting to see the doctor and agonizing over my discovery. In the six months that followed, I had a mammogram and a series of ultrasounds. Eventually in June 2007 a biopsy was performed, and the good news finally came. Benign tissue. One bullet dodged. A month later I caught a cold. I got a sore throat and thought I felt a lump when I swallowed. Another three months, a trip to a specialist, a CT scan, and two “nodules” were discovered, one on my epiglottis and one on my thyroid. Surgery was scheduled for the beginning of October, and once again, good news followed. Bengin tissue. Bullet number two, dodged. A biopsy on the thyroid nodule had the same result. Number three. You can’t ask for better gifts than that. So, I figured after getting luckly three times, it was time to shape up my act. During the throat issues, I quit smoking (again) but have managed to stay clean since the end of August 2007. As so many do, I made a few resolutions for 2008, mostly the usual ones. Eat better — more vegetables and more fruit. Mostly I save the good stuff for the kids and eat carbs. Exercise — More yoga (even bought a DVD for the kids to do with me); Ray and I bought a treadmill. Get organized — an uncluttered environment leads to uncluttered mind. Kiss my husband as much as possible. Tell people how I feel. Focus more on the accomplishments and less on the mess the kids make on the journey. Breathe in, breathe out. Repeat as often as necessary. Three passes last year, three misses, three gifts. It is a new year and I hope to make it the best yet.